Just got back home from my spring bear hunt. Had a great hunt! The 2 guys I was with saw about 75 bears. One guy shot the most beautiful blonde I have ever seen in my 25 years over there! Had beautiful long blonde hair with chocolate legs. (See attached photo) This was his 10th hunt with me! TENTH! As one of the hunters on this trip said when he found this out "You don't know how good that makes me feel to hear you have been on 10 hunts with Denny! I know he is doing something right for a guy to come and hunt 10 times with him! It's a great confidence booster!" One of the guys had an extra tag so the 2 guys shot 3 bears. One guy was from Australia who had been on two bear hunts in Alaska and spent $50,000 for those two hunts. On one hunt he never saw a bear and on the other he just saw a sow and 2 cubs a mile away on a mountain. He said to me, "Denny, can you imagine sitting on a mountain top glassing for 8 to 10 hours a day for 10 days and not seeing a single bear? Then on the next hunt same thing. Just a sow and two cubs after glassing all day for 10 days. You talk about getting discouraged. My wife didn't want me to go. I had to do some serious begging to get on this hunt. I told her this guy, Denny, I want to go with to Russia has an excellent track record for the last 25 years. He's my best shot at ever getting a bear. She told me . . . "You will just ruin his 25 year success rate!" You can only imagine how happy I was to see 18 bears in one day! At least I knew I was in an area that actually had bears around. I saw 46 bears by myself!" I get guys who have been to Alaska multiple times on almost every hunt. Last fall I had 3 of them. Same scenario . . . two hunts, $25,000 on each hunt, and no bears. Alaska has become one of my best reference sources for new hunters. Of course, not everyone who goes to Alaska gets skunked. 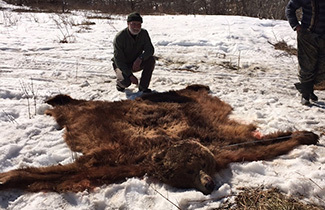 Most camps have a 40 to 60 percent success rates so about half the hunters shoot a bear. By comparison, we are over 100% when you count all the guys who shoot two bears. The moose success rate in Alaska is 26 percent statewide . . . so one in four guys are shooting moose. We are around 90% on moose. The other 3 guys in the other camp shot about a 9 1/2 bear before they got to camp. They shot 3 more the next day (first day of the hunt) of which one was a 9 footer and the other a 10 footer. (See photo) One guy had an extra tag so the 3 guys shot 4 bears. They were so tickled that one guy wrote me a check back in town the next day for 4 spots on next spring's hunt for the same week, same guides, and same camp. On the second hunt we had another guy who went to Alaska and got skunked and finally realized his dream and shot a bear with us. One of the guys shot an 11 footer which, according to my guides is bigger than the No. 5 bear in the world (being entered in books now) we shot last year. Here are two of the letters we just got back from our hunters. I have lots more of them if you need to see reference letters. 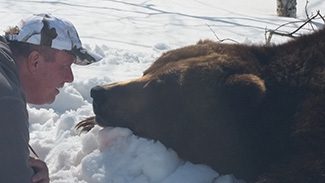 I want to thank you for making a life long dream come true, traveling to Russia with you was the best hunting experience and adventure I have ever been on and I have hunted in many places. 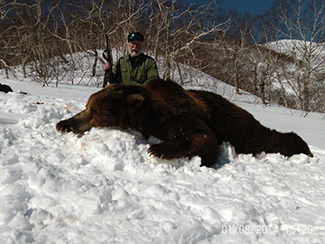 You and your team made it very easy to go threw customs and all the permits went very smooth, the Russian Guides were very professional would do anything for you I truly enjoyed hunting with them. that is why we are re-booking for next year. 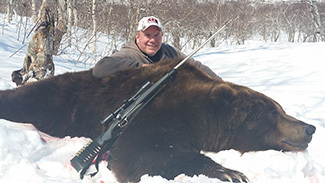 I tell people we had 5 Hunters between two camps and saw around 75 brown bears that is amazing, I have never been a trophy hunter but on this trip I got a true trophy 10 foot + bear that will score in the top 50 and I was able to take it with my best friend and hunting buddy Jim Kestloot. We had a great hunt with you in 2015. I tell everyone one this wasn't just a hunt, it was a real adventure. The Russian people we so accommodating and friendly on everything. The way you have it set up with the interpreters we didn't have to worry about anything. I shot my first bear (a nine footer) on the way in to camp. I didn't even unpack my gear yet! On the first day of the hunt I also shot a beautiful blonde / cinnamon 8 footer. I got to hunt with my friend and whiteness him shooting a spectacular 10 footer. Thank You again for the wonderful experience I cant wait to come back in 2016. I will see you soon. If you are thinking about shooting a bear with the No. 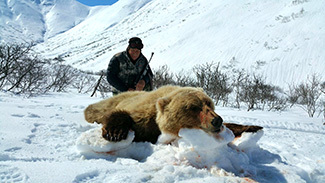 1 Brown Bear company in the world, give us a call. We have two spots left on the spring 2016 hunt and 3 spots on the 2016 fall hunt. We are just over half booked for the 2017 hunts and the year 2018 is still fairly wide open. And questions, give us a shout!